Beautifully designed, the Kalani Mini Crib by DaVinci will be eye-catching in any nursery. 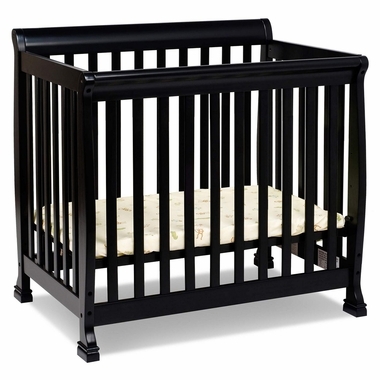 The elegant style is enhanced by the deep, Ebony finish that's also non-toxic for baby's safety. This solid pine crib is also durable to withstand even the most active of babies, plus it has static rails and an adjustable mattress support to keep your baby secure in bed all night long. This space saving crib can also be used past the baby years by converting it to a twin bed with the use of conversion rails. (rails sold separately) Give your baby the most beautiful, comfortable and safest baby bed possible by getting this mini crib today. Crib measures 40" x 28" x 38.5"